The 3-foot-wide rock rock visited us three years before 'Oumuamua. Artist's concept of 'Oumuamua, an interstellar object that was discovered zooming through our solar system in 2017. A new study determined that a small meteor that hit Earth in 2014 came from interstellar space as well. The first meteor to hit Earth from interstellar space — and the second known interstellar visitor overall — may have just been discovered, a new study finds. Interstellar meteors may be common, and could potentially help life travel from star to star, researchers added. 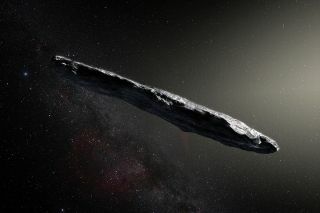 The first known visitor from interstellar space, a cigar-shaped object named 'Oumuamua, was detected in 2017. Scientists deduced the origins of the 1,300-foot-long (400 meters) object from its speed and trajectory, which suggests it may have come from another star, or perhaps two. Avi Loeb, the chair of astronomy at Harvard University, noted that one would expect smaller interstellar visitors would be far more common, with some of them perhaps colliding with Earth often enough to be noticeable. The scientists analyzed the Center for Near-Earth Object Studies' catalog of meteor events detected by U.S. government sensors. They focused on the fastest meteors, because a high speed suggests a meteor is potentially not gravitationally bound to the sun and thus may originate from outside the solar system. The researchers identified a meteor about 3 feet (0.9 meters) wide that was detected on Jan. 8, 2014, at an altitude of 11.6 miles (18.7 kilometers) over a point near Papua New Guinea's Manus Island in the South Pacific. Its high speed of about 134,200 mph (216,000 km/h) and its trajectory suggested it came from outside the solar system, the scientists said. "We can use the atmosphere of the Earth as the detector for these meteors, which are too small to otherwise see," Loeb told Space.com. The meteor's velocity suggested it received a gravitational boost during its journey, perhaps from the deep interior of a planetary system, or a star in the thick disk of the Milky Way. "You can imagine that if these meteors were ejected from the habitable zone of a star, they could help transfer life from one planetary system to another," Loeb said. The scientists analyzed about 30 years of data. In addition to the interstellar meteor they discovered, they also noted two other meteors that traveled at about the same speeds. However, Siraj and Loeb noted the orbit of one of these meteors suggested it was gravitationally bound to the sun, while it was uncertain whether the other was interstellar or not. This suggests each nearby star might gravitationally sling about 60 billion trillion such rocks from its system, equal to about 0.2 to 20 times the mass of Earth. Ten billion trillion is "roughly the number of stars in the observable universe," Loeb said. Siraj and Loeb noted that analyzing the gaseous debris of interstellar meteors as they burn up in Earth's atmosphere could shed light on the composition of interstellar objects, about which much remains uncertain. In the future, astronomers may want to set up an alert system that automatically trains telescopes on meteors traveling at high speeds to analyze their gaseous debris, Loeb said. "From that, we could infer the compositions of interstellar meteors," he said. The scientists detailed their findings in a paper that has been submitted to The Astrophysical Journal Letters. You can read a preprint of it for free at arXiv.org. Follow Charles Q. Choi on Twitter @cqchoi. Follow us on Twitter @Spacedotcom or Facebook.